Get ready for an Sweet Saturday! 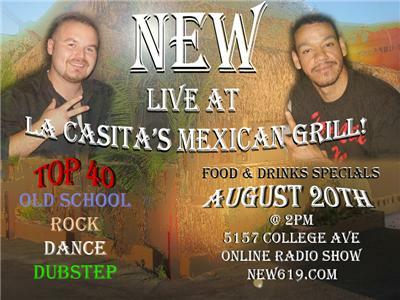 The New Entertainment World's Jason G and DJ A-Ron will be broadcasting their radio show live at San Diego's Hottest Mexican Restaurant, La Casita's Mexican Grill!! There will be Live Music from Several genres, Remixes from Jason G and Booming Dance Mixes from A-Ron, Menu Specials on Food & Drinks and a few giveaways to those who are in attendance!! Including Music from Artists such as, Warner Drive, After, Jason G and DJ A-Ron and many others. The N.E.W. would like to thank La Casita's for allowing us to have this Summer Event at their establishment! We are looking forward to the outcome and seeing those San Diego Smiles! Let's Party Baby! !